The figures mentioned in yesterday’s comment as possible betting markers in the on-going global gold roulette turned such bets into rich chips overnight, as the 75 level on the dollar index was once again breached, the euro pushed back to just above 1.50 against the greenback, and the $1175 level on gold was not only touched, but surpassed by a further $8 per ounce. Last night’s risk appetite grew on the heels of reports that India may decide to raise its gold allocation to 8% by possibly purchasing the remainder of the gold that the IMF has made available in its quest for cash. New York spot gold dealings opened the pre-holiday session with strong gains – fueled by the short-the-dollar euphoria which has powered them $100 higher in but a few days’ time. The metal was seen having a relatively easy time adding dollar after dollar of gains as the US dollar fell to 74.50 on the trade-weighted index in early morning action. Gold added $13 to start at $1181.20 per troy ounce, silver rose 20 cents to $18.67 per ounce, and platinum gained $23 to $1470 per ounce. Palladium climbed $4 to $371 per troy ounce. Gold buyers this morning once again ignored the technical picture, as well as news from the physical side of the market, where “scrap supply rose as consumers sold their holdings at record prices. The availability of recycled gold in India, the world’s largest consumer, rose 12.5 per cent in the third quarter of the current calendar year on heavy selling of used jewellery by retail consumers at record high prices.” This, from the Business Standard, India. The noble metals complex as well, responded more to the same dollar-carry action rather than the news that U.K. platinum refiner Johnson Matthey reported a 20% drop in fiscal first-half profit, hurt by slumping demand for cars. The company maintained it did well given global vehicle sales slumped 16% and average platinum prices fell 33%. Car sales are important to Johnson Matthey because catalytic converters contain platinum metals. The company said it’s not sure how car sales will go from here. “A recovery in heavy duty diesel vehicle sales in the key European and North American markets is equally hard to predict.” But tighter 2010 emissions standards for on-road heavy-duty-diesel vehicles can “substantially” increase potential catalyst sales per vehicle. Analysts at Belgium’s GoldEssential.com offered an early morning glimpse into the technical makeup of the current gold market and found that: "$1,200 is definitely the short-term bull target as long as the EUR/USD pair remains above 1.50". Persistent strength was seen following the December options expiry and charts are now massively in overbought territory. "The 14-day RSI is hovering above 85, which is starting to look like beyond common sense". A London trader said in an interview that "participants are also taking their advantage of thin market liquidity ahead of the US Thanksgiving holiday tomorrow." “Well, we may have a little deja vu all over again. What is the commonality between oil at $140 and gold at more than $1,100? The answer is that demand for the oil was declining as oil approached $140, and the same is happening in Gold. "Gold demand fell 34 per cent in the third quarter as high prices weighed on investment flows and led to a slump in jewellery buying in key markets like India and the Middle East, a World Gold Council report showed last Thursday. But speculation in gold futures and expectations for more official sector bullion buying are keeping prices elevated despite a dearth of physical demand, according to the WGC’s investment research manager Rozanna Wozniak." "’For most of last year, the buying was very physical,’ said Wozniak. ‘(Now), it seems to be more financial market-driven, by some of those other less visible instruments — derivatives, futures, over-the-counter transactions. "’ That physical demand is sparse and speculative demand is strong should serve as a warning of impending danger in the market for $ gold. “The second thing that stands out from these charts? The massive, overwhelming, extraordinary… absence of any hyperinflation panic whatsoever. Right now the bond markets are predicting inflation will average about 2.4% over the next two decades. A few years ago they thought it would be closer to… 3%. And this is not a forecast for consumer price increases over the next one, three or five years. This is the forecast for the next two decades. The year 2029 is as distant to us as we are from 1989. Some years ago, when I was researching my first financial book, on sports betting, I was struck again and again by the human ability to see something that isn’t there. (During the 2002 Super Bowl, fans continued to bet on the heavily favored St. Louis Rams to trounce the underdog new England Patriots well into the game – even as the Patriots were already showing the strength that would take them on to win.) People will see, and bet on, what they expect to see, what they want to see, or even what they are told they are seeing, as often as they will see, and bet on, what they are actually seeing. In this instance it is remarkable the number of people who are “seeing” hyperinflation down the road where none is, so far, apparent. Second, this forecast is one embedded in bond prices. So it’s merely a market forecast, not one written in stone. Obviously the bond market may have it wrong. Inflation may come in much higher than expected. Indeed that has to be a major risk, and investors need to be on guard against it. But before gold bugs point to the booming gold price as “proof” that the bond market is wrong on inflation, they need — at least intellectually — to concede that the reverse might also be true: That it might be the gold price that is out of line, and the bond market that has it correct. So if the booming gold price says anything important about the future, it isn’t simply proof that inflation is about to skyrocket. There are lots of things keeping inflation low, as well. (Bijal Shah, global strategist at investment firm Icap in London, thinks U.S. inflation may be as low as 1% late next year). And even if gold works over the very long term as a hedge against inflation, be aware that long term may be too long for you, the individual investor, anyway. Gold prices can fall for years, even decades, in real terms. Someone who bought it near the last peak, in 1979-1980, saw most of their purchasing power erode over the next 20 years. In practical terms gold was a disastrous investment. If gold really is effective as an inflation protection, that may apply most to institutions with very long memories indeed — like central banks, university endowments, and wronged first wives. Maybe gold is the next mania. If so, there is still a lot of money to be made speculating. The white-hot speculation engendered by such apophenia (the phenomenon of seeing things that aren’t there, or the experience of seeing patterns or connections in random or meaningless data) is also drawing some attention in circles where the speculators are hoping no one will notice. Like the circle that makes up the Fed. Jawboning from the US central bank has turned…interesting of late. While the Fed’s take on matters appears to be more of acknowledgement than a shot across the bow of the speculator’s boat, Bloomberg reports that: “Federal Reserve officials said record-low interest rates might fuel "excessive" speculation in financial markets and possibly dislodge expectations for low inflation, according to minutes of their meeting released on Wednesday]. "Members noted the possibility that some negative side effects might result from the maintenance of very low short-term interest rates for an extended period," minutes of the Nov. 3-4 meeting said, "including the possibility that such a policy stance could lead to excessive risk-taking in financial markets or an un-anchoring of inflation expectations." While policy makers agreed that the chances of such effects were "relatively low, they would remain alert to these risks," the minutes showed. "Participants noted that the recent fall in the foreign exchange value of the dollar had been orderly and appeared to reflect an unwinding of safe-haven demand in light of the recovery in financial market conditions this year," the minutes said. "Any tendency for dollar depreciation to intensify or to put significant upward pressure on inflation would bear close watching." In so many words, the central bankers quoted above, delivered a milder version of Prof. Nouriel Roubini’s presentation earlier this month, at the Inside Commodities Conference at the NYSE. The trend, in other words, may not at all be your friend, as far as this brand of asset class speculation is concerned. Why, it cold even bring about “asset liquidation part II” if it keeps up and bids dry up eventually. That, when -and not if- the Fed changes course. 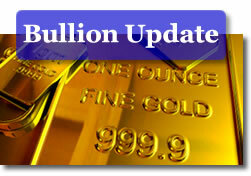 gold will be over $1,200.00 and hit a high of $1,350.00 by december.